After tabling legislation in late October that would abolish the long gun registry, Prime Minister Stephen Harper let the other shoe drop: that in addition to the registry ceasing to exist as a tool to pry into your private life or help police officials stop violent crime (depending on your outlook), all data collected since the registry’s inception in 2001 would be destroyed. While proponents often idealized the registry as an effective tool for law enforcement to understand and analyze gun purchases and to help reduce and solve crime, the government has long argued the registry was a needless level of bureaucracy that criminalized hunters and other gun law-abiding owners, while reaching deeply into the private lives of citizens. Law enforcement, one of the pillars of the conservative law and order platform, by and large supported the registry. Yet despite statistics showing a decrease in violent crime and the support of law enforcers country-wide, the mood in the Prime Ministers Office had long soured on the registry, if indeed it ever supported it. Globe columnist Lawrence Martin’s 2010 book Harperland even alleges that an RCMP report released before the final decision was made on the registry was shelved by the government until after the vote was taken. Why? Largely because it contradicted the predetermined and oft-stated message coming from the PMO that the registry was an intrusive, expensive nuisance. It simply had to go. And while the state may have no place in the bedrooms of the nations, Harper was intent to keep the state out of the nations gun cabinets as well. Immediately after announcing that the data would be destroyed along with the registry, Quebec cried foul. The province had long been the registry’s staunchest defender, and had been among the most vocal proponents in having it added as an amendment to the 1995 Firearms Act in response to the 1989 shooting at Montreal’s École Polytechnique which resulted in the deaths of 14 women. Without the kind of information the registry made available to law enforcement, Quebec feared, events such as École Polytechnique could happen again. In the days following the registry announcement, Quebec Premier Jean Charest told reporters that the National Assembly was “analyzing the means at our disposal” to determine how best to have Quebec’s voice heard in Ottawa, according to CBC. And that view was this: Quebec opposed abolishing the long gun registry and the very idea of destroying the data, wanting as it does to retain the information within the registry that pertains to firearms bought in Quebec. They reason that Quebec taxpayers had spent roughly $500M on building the registry since it came into effect and that they had a right to keep what they had paid for. And what’s more, that Quebec would not hesitate to resort to litigation if the Prime Minister would not voluntarily hand over the data. Mr. Speaker, the answer is no…The provincial governments are free to act in their areas of jurisdiction, but we will not help them create another registry by the back door. The information in our possession will be destroyed and the registry will be abolished once and for all. And despite repeated requests for reason, and a vain hope that cooler heads would prevail in time, Quebec has announced that they will be moving forward with legal action against the federal government over access to registry data. 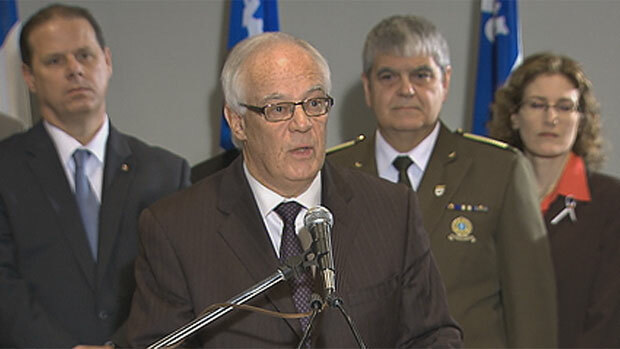 Quebec Public Security Minister, Robert Dutil, made the announcement on Tuesday morning in Quebec City surrounded by law enforcement officials and representatives of crime victim groups that simply creating a new database would be prohibitively expensive and it would take years to reach the level that the current registry is at. And why pay again when Quebecers have already shelled out $500M to build the current registry? The fine points of the lawsuit have not been released. In a twist of legal detail, you cannot oppose that which does not exist, and so the litigation cannot move forward until Bill C-19, the law destroying the registry, comes into effect. This will likely be in January 2012. Until then, Quebec will wait for a change of heart they must know by now isn’t coming.